This octagonal folding seating unit is ideal for use in school dining halls, canteens and cafeterias. The modern design and shape of the table provides a contemporary look in dining areas. Effortlessly convert school halls into multi-use dining areas without heavy lifting in minutes with this folding school dining table. This folding seating unit comes with an octagonal shaped table top. The table top is made from laminated MDF and is finished with an ultra-tuff edging, which is water resistant and allows for easy cleaning and improved hygiene. Laminated table tops are available in a choice of 3 colours – maple, blue (speckled blue/grey) and grey. This folding table unit comes with 8 spaced seats. The stool seats are a one-piece, injection-moulded ABS plastic shell and are 330mm in diameter. They each have a maximum load bearing weight of 150kg and are available in a range of 10 colour options - red, green, yellow, blue, black, wine, blueberry, orange, apple green and lilac. Multi-coloured seats are available on request - call for more information 01733 511121. 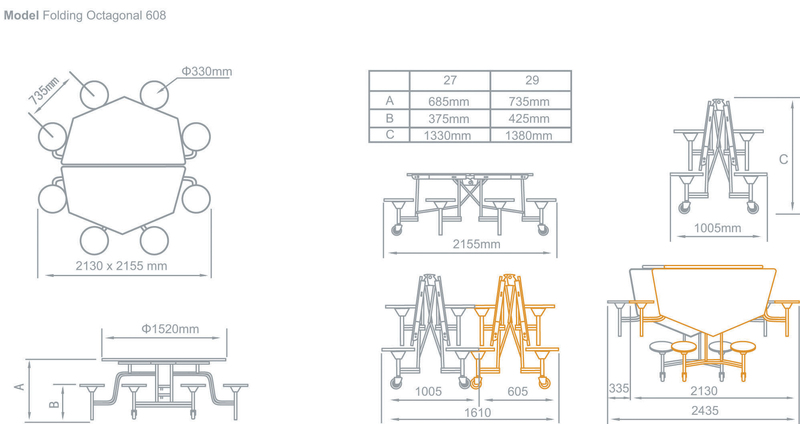 Choose from 2 heights - 685mm and 735mm. The dining table is ideal for both primary and secondary school use and conforms to the BS EN 1729. 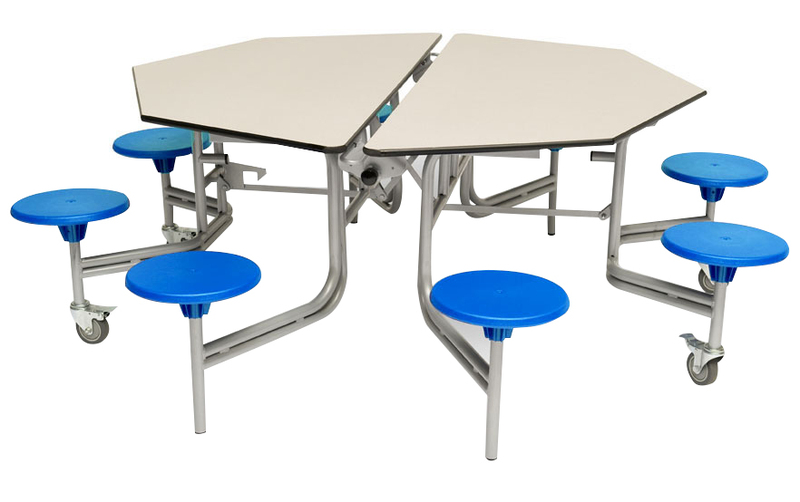 This makes the table comfortable for children through the ergonomic design, and also means the unit provides appropriate posture for students. The octagonal table unit comes with 4 easy-glide locking castors, when in the folded position it can fit through a standard doorway (1980mm) to allow for easy transportation between halls and simple storage. 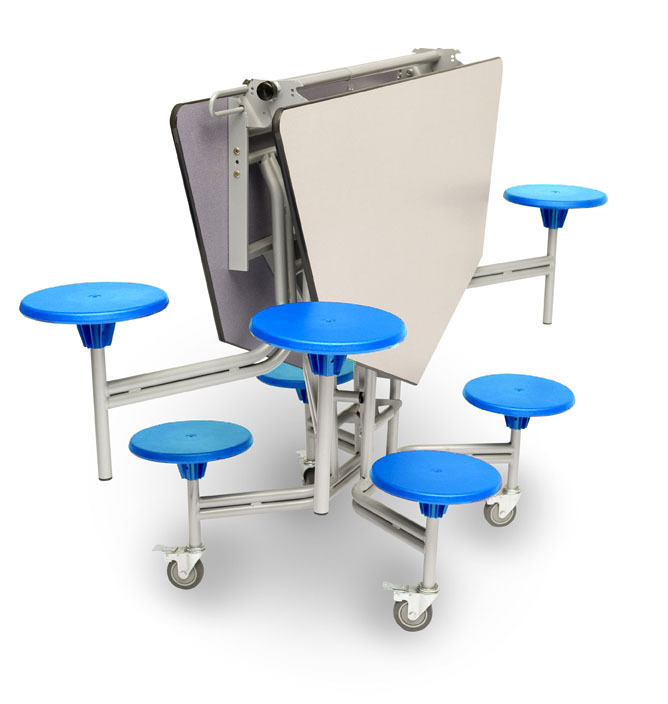 Complete with 3 locking positions for ease of use, the table can be folded and locked in place to both improve safety and hygiene. 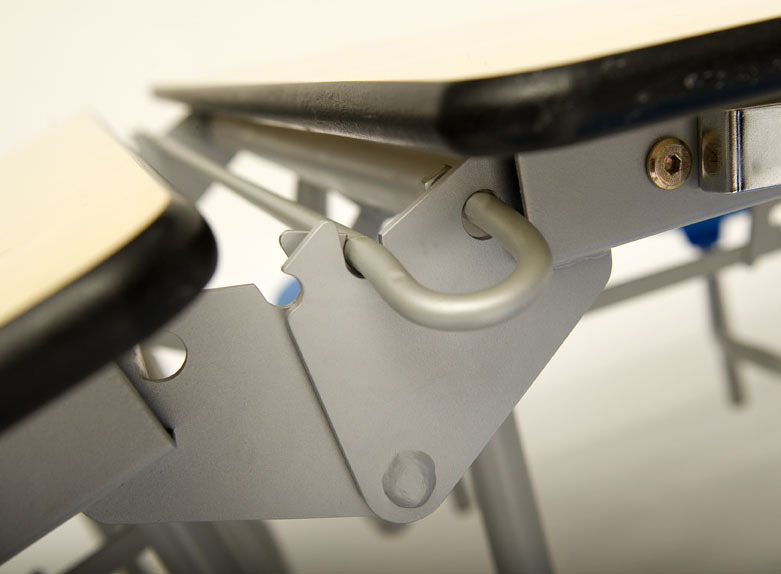 The easy clean intermediate lock helps ease access of the floor beneath the table and the table top itself for improved hygiene. 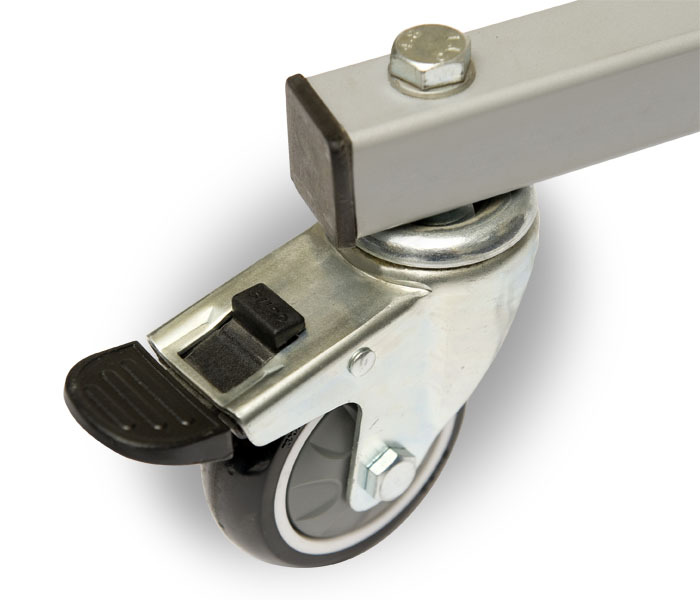 The open position safety lock ensures that the table will not revert to the folding position and is secure when folded open for use. The stow-away closed locking position ensures the table is secure for transporting and storage. This dining table has been tested and certified by FIRA and is deemed structurally suitable and sufficiently stable for use in educational establishments. Here at ELF, we aim to provide the most viable solutions for our customers. This is why we offer a FREE 3D planning service and a FREE site survey. The FREE 3D planning service helps to create bespoke space plans and solutions for school dining halls, cafeterias and canteens. The FREE site survey evaluates your needs in order to create the best possible solution in terms of positioning, styling and quantity of dining tables. FREE 3D planning service and FREE site survey.